Nathan Nandala Mafabi, the FDC party Secretary General, who engaged Police officers right away from Hoima, described the decision of security agencies to sabotage opposition mobilisation programs as fruits of President Yoweri Museveni's patronage. Internet Photo. 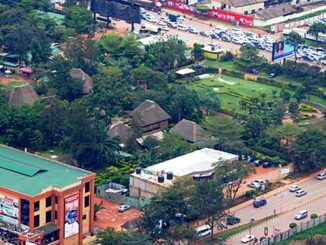 Police on Tuesday dispersed a rally organized by the opposition Forum for Democratic Change (FDC) Party at Masindi Stadium. The FDC leaders first convened a retreat for party officials drawn from for Bunyoro sub region at St. Nicolas Hall, Bujumbura in Hoima municipality to evaluate their performance in the 2016 general elections. After concluding the retreat, the FDC leaders drove to Masindi town where they had convened a rally at Masindi Stadium to sensitize residents on land matters. The officials arrived at Masindi Stadium at around 5pm and agreed with police to conclude the rally within 30 minutes. 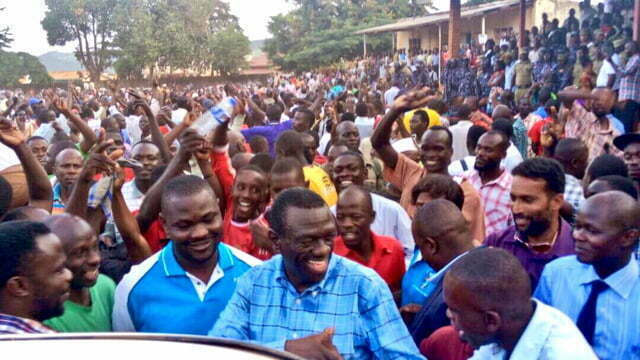 Dr. Kizza Besigye, the former FDC president addressed the residents and urged them to jealously guard their land from government officials who have turned to it for survival since they have stolen all the money for service delivery. 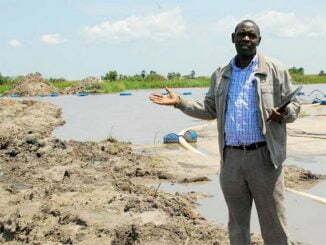 Besigye warned that Bunyoro region will continue suffering at the hands of the NRM government whose interest is to take away people’s land for selfish interest and the steal Oil money. However, before Besigye could conclude his speech, Ronnie Waiswa, the Albertine Region Police Commander signaled him to leave the podium, saying the 30 minutes allocated for the rally were over. 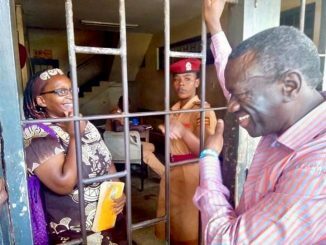 Besigye ignored the directives and continued speaking leading to a heated verbal exchange between FDC party officials and heavily armed police personnel. As a result, Police threatened to use teargas prompting Besigye to cut short his speech and drive away with police patrol cars behind him. Waiswa told reporters that they couldn’t allow Besigye go beyond the allocated 30 minutes. Nathan Nandala Mafabi, the FDC party Secretary General, who engaged Police officers right away from Hoima, described the decision of security agencies to sabotage opposition mobilization programs as fruits of President Yoweri Museveni’s patronage. Nandala noted that although Uganda is viewed as a democratic country, government uses state power to deny other people their rights. Earlier on during the retreat, Gen. Muntu warned that the management of the Oil and Gas resource in Bunyoro Sub region is a potential source of conflict as the country heads into production. He said it is as a result of this that the party has engaged experts to train their regional leaders on conflict prevention, management and resolution.